Mom's Gone Bronson! : SO MUCH Ice Cream to Choose From This Season!!!! SO MUCH Ice Cream to Choose From This Season!!!! Disclaimer: I was sent coupons to try out these brands for you and so here we are, sharing the yumminess of ice cream. All thoughts and opinions are my own and your views may differ! The sun is shining and we are over the worst of the winter months and spring is finally here! With the warmer weather comes fun and laughter, trips around town, dining outside AND one of our favorite things - ICE CREAM! There are SO MANY different kinds of ice cream to choose from these days, but did you know that there are some NEW products out there to go with your classics and favorites! 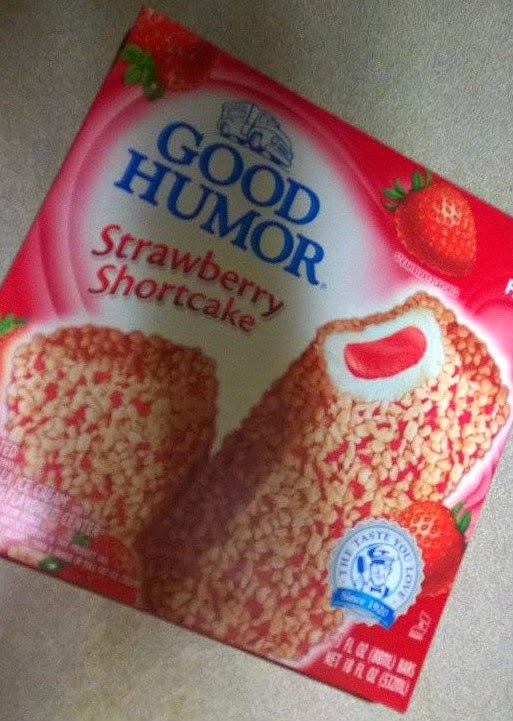 These Good Humor Strawberry Shortcake ice creams are one of our whole family's favorites and the go down well as a way to cool off when the sun gets too much, or as an after dinner treat! 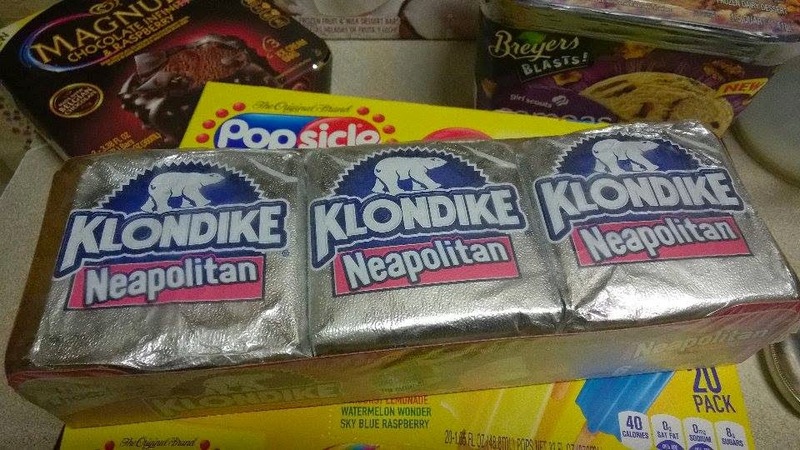 Then you have these NEAPOLITAN Klondike bars, which I had never seen or tried before today - in fact, I didn't realize just how many different flavors of Klondike bars there are available between the regular bars and the Kandy ice creams! You can get mint, Reese's, original and plenty of others, which includes NEW flavors like COOKIE DOUGH SWIRL!!! Then you have Fruttare! 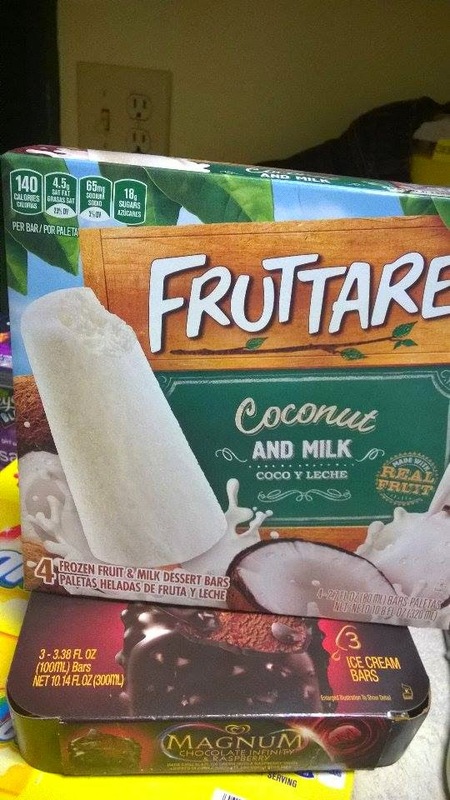 I picked out the coconut and milk variety and you can see me enjoying it in the top pics in this post! I love them, I really do! Coconut is one thing I can't say "no" to, and the mix is just spot-on perfect! You can also get Fruttare bars, made with delicious fruits in strawberry, black cherry, pineapple and more! - Discover them HERE to find one you're going to love as much as we do! 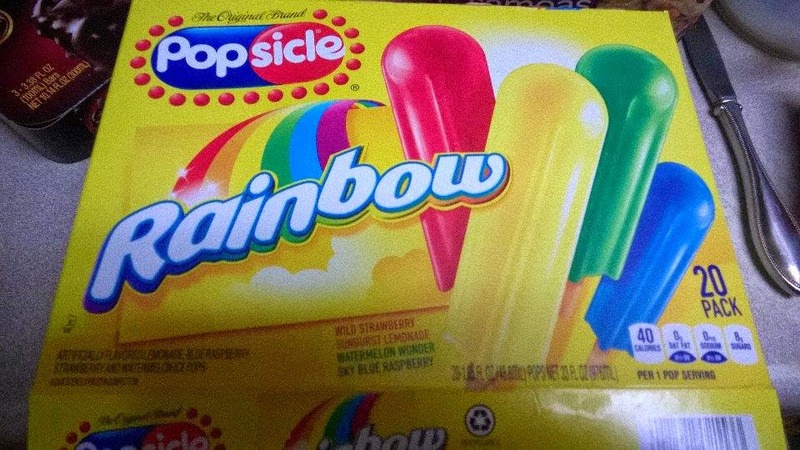 And how about picking up some Rainbow Popsicles?! The kids LOVE these and they taste great when you're just sitting around on a hot and sticky day! They come in fun colors and turn your tongue whatever color you're eating and the kids find that something to laugh about! 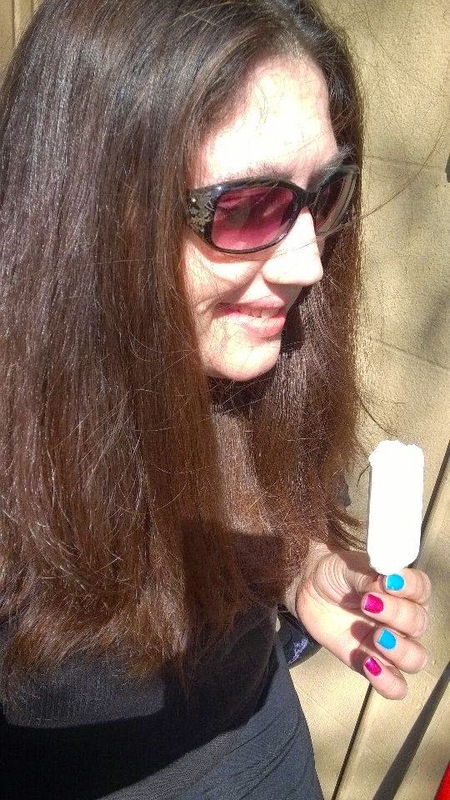 Popsicles are the treat that keeps on giving! 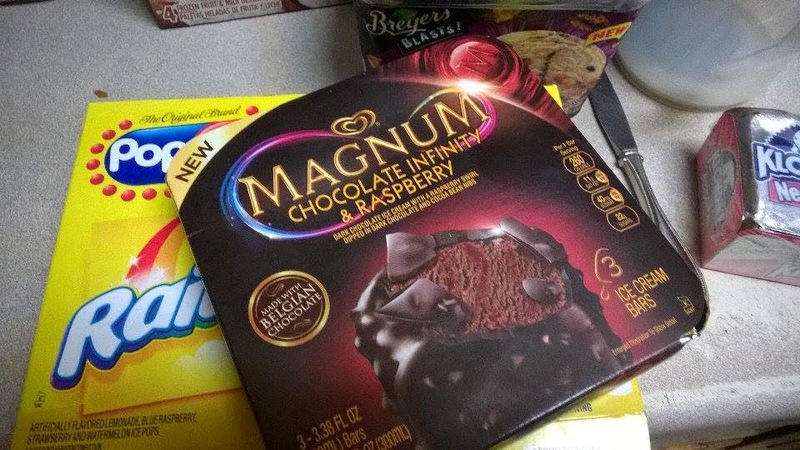 You HAVE to also try these Magnum Infinity bars in Chocolate and Raspberry! If you love dark chocolate as much as I do, and ice cream, you'll love these! Magnum ice creams have always been one of my favorites but they have truly outdone themselves with this incarnation and I can't get enough of them! Seek them out and see if you're with me, they rock my warm-weathered socks! AND WAIT! There is MORE! 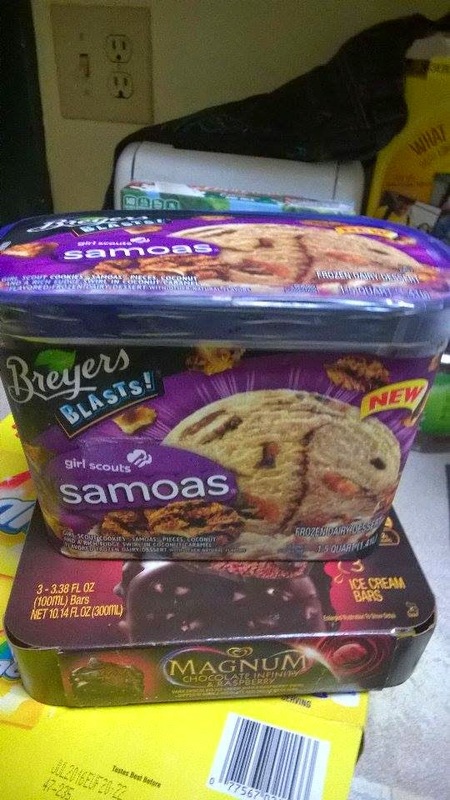 If you love girl scout cookies then you are in for a treat, because you can now get various cookie sensations like this NEW Breyer's Blast Girl Scout SAMOAS ice cream (and Thin Mints!!). SO addictive in the best possible way, and great in a waffle bowl or on a cone! You can ALSO get Good Humor Girl Scouts Thin Mints Bars, MAGNUM double peanut butter AND Disney's Frozen Popsicles, which come in Blue Raspberry, Purple Berry and White Cherry! You can also get Popsicle Mystery Middles and Popsicle Tootsie Pops! 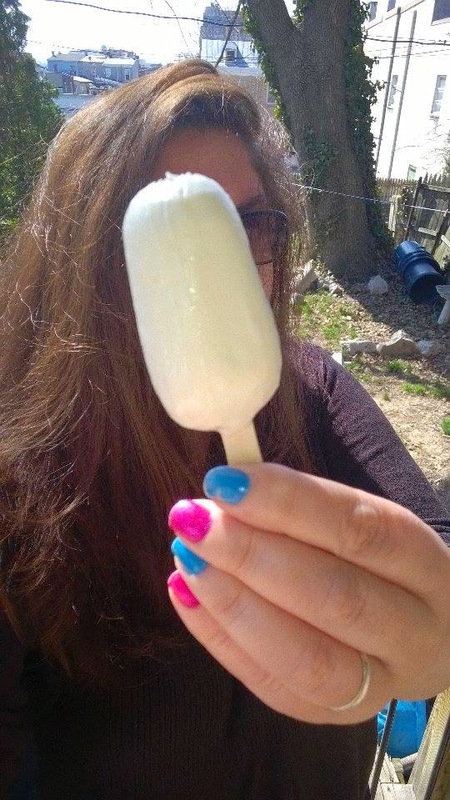 You can find out more about Popsicles HERE and keep an eye on my blog as I check out more in the ice cream isle over the warmer months! In conclusion, have you SEEN how much choice there is out there for a sweet treat this (and every) season!??? 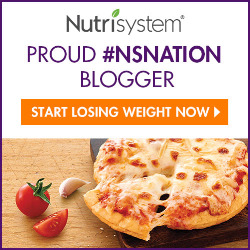 Go to your local grocery store and stalk the ice cream section to find out more! Unilever has you covered with the most magnificent choices and you won't be disappointed at all! I know we're not - we're ice cream fiends over here! Night at the Museum: Secret of the Tomb!